NFPA® provides instruction that's vital for your work -- online in your own time frame -- with this new training series. Work at your own pace to gain the type of critical knowledge needed for job success, and help you prepare for accreditation programs such as the NFPA CWBSP program. Anyone whose job involves designing, reviewing, evaluating, or installing water-based fire protection systems, including: designers, installers, engineers, electrical contractors, technicians, project managers, fire marshals, architects, sprinkler system and standpipe engineers, plan reviewers, maintenance personnel, inspectors, manufacturers, and insurers. 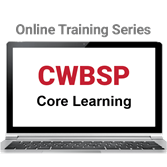 Anyone who is planning to take the CWBSP certification examination, as well as water-based systems design professionals interested in furthering their knowledge of project development, new and existing systems design, and hydraulic calculations, and others expected to maintain this certification as part of their education requirements. Complete this six-hour course series and qualify for 0.6 CEUs. Completion of each individual course qualifies you for 0.1 CEU. Upon successful completion of the course series, participants will be prompted to download the CEU certificate directly from the course site.